Top-draw extreme sports writing from Todhunter (Fall of the Phantom Lord, 1998), unadorned and vital and appealingly decorous. This collection of magazine pieces, mostly drawn from The Atlantic Monthly, showcases Todhunter's talents as a chronicler of extreme sports—some of which he partakes of himself. 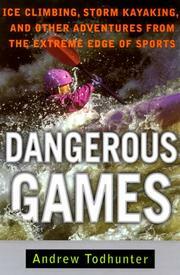 Although the author now has a family to bevel his more flamboyantly dangerous sporting appetites, that doesn't deter him from a short, roped free fall off a cliff or hairy icefall ascents—but he draws the line at storm kayaking in the Pacific off northern California. He writes without bravado, without false modesty or striking poses. He is simply fascinated (bewitched, maybe) by dangerous sports, by what motivates people to engage in them. But there are no clear answers to the question of his own motivation, and just disturbing intuitions: about the aesthetics of danger, or regarding his convictions that some climbs are "worth dying for," that "the wisdom of timidity reeks so powerfully of death." There is a passion for the genuine, whether that is winter climbing in the Scottish Highlands, which still feels a grizzled affair best done in hobnailed boots, or if a chainsaw is worth the price: "that what relieves us of our labor removes us from our lives. We grow more frail and dim-witted with each invention that outstrips us." The best piece of all concerns an activity made of magic rather than stark terror. It happens on—make that in—a frozen lake: Todhunter and a friend are ice diving and have inflated their suits so the buoyancy allows them to stand on the under-surface of the ice. They are tethered to tenders by a long rope a good distance away from the entry hole. The tenders start to pull: "The lines go taut and we begin to move, gaining speed. Howling through our regulators, we ski upside down across the ice." Todhunter at times misplaces his fear, though his artful talent for describing the telling moments in extreme sports, as well as their often-otherworldly settings, is everywhere.